You may have heard that GM has offered selected 18,000 salaried employees and opportunity for retirement buyout indictments. Chances of it happening at BGA are small as follows, thanks to an article we just saw in CorvetteBlogger. On Wednesday this week, General Motors offered six months of severance pay to 18,000 salaried workers in North America who have 12 or more years of experience. November 19th is the deadline for employees to volunteer for the buyout. Bowling Green Assembly UAW Local 2164 President Jack Bowers isn’t expecting a huge impact at the only factory in the world that produces the Chevrolet Corvette. 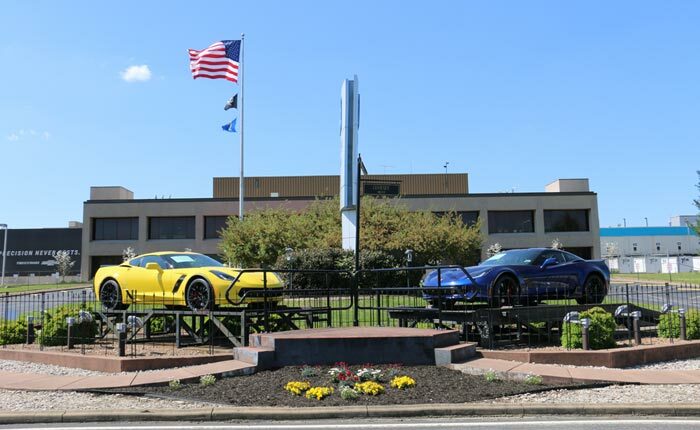 With 200 salaried employees and 800 hourly workers, the Corvette Assembly Planthas been the recipient of nearly a billion dollars in upgrades and renovations over the last two years. Those renovations doubled the size of the plant with a new state-of-the-art paint shop. And while sales of Corvettes are running 21% behind last year, the company may be gearing preparing to launch the 8th generation Corvette sometime in 2019. GM says the buyouts are being offered to make improvements in the company’s bottom line while its finances are strong. GM reported a third-quarter net income of $2.5 billion. General Motors this week also postponed the new studio building for the Design Center and stopped work on the Pontiac Propulsion workspace which is estimated to save the company hundreds of millions of dollars. In an email to salaried employees, GM chief executive Mary Barra said that GM’s “structural costs are not aligned with the market realities nor the transformational priorities ahead. We must take significant actions now to address this while our company and the economy are strong,” Barra added. "Bowling Green Assembly UAW Local 2164 President Jack Bowers isn’t expecting a huge impact at the only factory in the world that produces the Chevrolet Corvette. Not sure if I can conclude that "GM Buyouts Not Effect BGA In All Likelihood" as the title of the article suggests. I don't think that "with all we have going on" would factor into anybody's decision to take the buyout. I believe those kinds of decisions are based on the personal/private financial and other considerations of each individual eligible not the labor demand at the factory. Anyway, I'm sure it won't have a dramatic impact on Corvette production as they probably have that factor figured out even if there are a greater number of buyout takers than anticipated. "...the Corvette Assembly Planthas been the recipient of nearly a billion dollars in upgrades and renovations over the last two years." WOW, that shows GMs commitment to the Corvette! GM has not offered the buyout option to 64% of its salaried workforce. And historically, typically just 10-15% of those who are offered a buyout ever accepts one. Looking forward to our ME arriving. I think that GM wants younger engineers that are more in tune with the latest tech. The only way a salaried employee is going to take that voluntarily is if they were thinking of leaving anyway. Two weeks or less per year of service is minimal. Layoffs. So it's likely that managers may make some employees an offer they can't refuse. "take the buyout now or I lay you off with nada". This is coming from a manager with a US Corporation who sadly presided over a lot of layoffs. Last edited by Bikerjulio; 11-02-2018, 07:49 PM. At other GM factories where sales of the GM product is slowly, sure that it is between a possibility to a probability. But lay offs at BGA where a new gen is coming next year? This is salaried employees we are talking about here, not production workers. Like all those that inhabit the ME forums and insist that the FE is here to stay. Last edited by John; 11-02-2018, 08:56 PM. I doubt that. No matter what, the first year of a new generation is gonna have high demand and resources need to be there to satisfy that demand. John--can assure you that BGA will be impacted.. It is not speculation it is a fact. Been through these things with a company bigger than GM for my entire working career. There may no or a small changes be a change in the 'net" number of heads at BGA HOWEVER, there will be changes in the last names of the people there. just the way these things work HR will absolutely make it so unless GM wants to have thousands of lawsuits filed. It is all about $$$$$$'s and sad but true getting out the old people and replacing them with lower paid younger ones. Very sad BUT it happens and that is the net result of actions such as this. A legal way to get rid of the old workers. Been a part of it in the past sad to say. Dave, I respectfully disagree. I too worked for a large organization with salaried and union employees. There were times of employee count reductions, for example, when we did not even consider cutting a single salaried employee in division X or conversely, decided to only cut salaried employees in divisions A, B and C.
GM, has, with salaried employees the ability to decide which employees are offered buyouts or not. They could choose to exempt a complete factory, a complete operation or division. As noted in the CNN article, they are planning to offer the buyouts to 36% of their employees. Could they choose to exempt BGA? As you know we are not talking about union employees, thus not union contracts. We might just disagree and see what happens over the next time period. If I am wrong (certainly possible), and GM extended the buyout offer to BGA salaried employees, and consequently are three or even thirteen salaried employees choose to take the offer, it will not effect the quality of the remaining C7’s nor the upcoming C8’s. Last edited by John; 11-04-2018, 10:35 AM. John--understand your position and respect that. In the end you will see and yes I am only speaking about salaried positions. Union contracts have provisions that are complicated and in effect isolate them to the business unit in question. I read very carefully what the GM release contained and have been through these before. Yes everyone wants to think that the BGA is the perfect organization that is exempt from this round of GM cost reductions however, in the real world throughout all of the large corporations that I have dealt with recently not 10 or 20 years ago, times have changed on the HR side of the equation. Thank you Dave. I guess the most important piece of the puzzle is that if there are BGA salaried employees who are offered the buyout, for most within GM working on the Corvette is their dream job, so the “replacement talent” pool would be nice. i doubt many will be jumping to take that buyout unless there is more to the buyout that we are not hearing. i really doubt six months salary is so lucrative an employee at the corvette plant. Is going to take that buyout. the sedan market is collapsing at an exponential rate....so plants that produce slow selling sedans are vunerable to closure. that said the six month salary deal might be a smart move by those salaried employees. i still think six months salary stinks as a buyout..
i believe back in the day one or two months per year was a good deal ..
Last edited by JB; 11-05-2018, 06:50 AM. I took a buyout from my 1st employer (a well-known aerospace company) back in 1999. It was described as a "voluntary RIF (reduction in force)". They gave us 1 month severance for every year of service, and after my last day I literally walked across the street in the industrial park to my new employer (a multi-national automotive supplier that you've all heard of). So, I got 6 months of severance, and enjoyed a double paycheck during that period (including a 15% raise). My new employer was much better than the old, as well. I was also fully-vested in my prior company's 401K and even in the pension plan, after being with that company 6 years. Given the recent FED jobs report, that mentioned there are a record 7.14 million job openings currently, I expect there will be many who can benefit (as I did) from this type of buyout. Great point Mobius. With overall labor demand as high as it is, I'm sure there are some folks in a position to take their skills "across the street" and pocket the buyout too. The favorable employment conditions may actually cause more people to take the buyout than otherwise would. Like I said in an earlier post I believe taking a buyout is a purely individual decision based on an employee's personal financial and other considerations.